After the constant enquires for the Znoelli Discs I have rang the supplier and got current prices. Prices have gone up a little but still very affordable. Need atleast 3 pairs to get it going! This is most likely the VERY LAST GB I'm able to do as my contact is leaving for the UK on the 23rd July so get in while you can!!! S6 Sports Disc Rotors - These are directionally slotted (grooved) to provide benefits such as reduced brake fade through pad de-gassing, increased wet performance through the dissipation of water, mud & dirt, improved pedal feel through increased pad bite, improved rotor life through pad deglazing and of course they look more purposeful behind alloy wheels. DDS Sports Disc Rotors - These utilise a curved wide slot to provide all the advantages outlined above. The wide slot draws cool air across the face of the pad allowing cooler running and the dimple drilled areas further break down gases. They also provide a great look but without the risk of rotor cracking that can sometimes be associated with cross drilled discs. S12 Sports Disc Rotors - These brake discs are designed with the track day enthusiast in mind. Utilising 12 curved slots and TTP technology, S12's offer excellent performance with good pad bite and provide you with the ability to monitor your disc temperatures. What's a "Slotted Disc Rotor"? A slotted disc rotor is a high performance product that has a number of grooves (slots) to both the front and the back of the disc rotor. Why is there a left and right rotor? 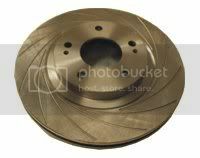 Slotted rotors by design are directional and this means there is a left and right rotor which must be fitted as such. Think about tyres for a moment. Many high performance tyres are directionally designed because you spend most of your time driving your car forwards not backwards. So it makes sense for the tread pattern on high performance tyres to be designed optimally for that direction. Similarly our slotted rotors are also designed for that forward direction. What do the slots do? Brakes get hot, the more you use them the greater the heat. 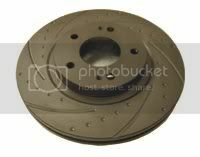 Brake fade occurs when the heat causes some of the bonding agents to fume or produce gas. 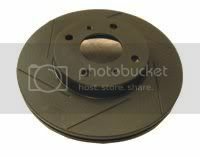 This gas on a standard rotor, creates a cushion between the pad and the rotor. As a result your ability to stop is massively reduced. The slots are very efficient at removing that gas and thereby maintaining braking ability. The slots have sharp edges that increase the pads ability to grip the disc. This helps the vehicle stop faster. The sharp edges of the slots "shave" the face of the disc pad. This means that there is alway "fresh" pad in contact with the disc. They help pads wear evenlyThe shaving action helps the disc pads to wear more evenly which means that there is more effective pad area available to stop the vehicle. As a result of the pads wearing more evenly, the rotors also wear evenly which extends their useful life. Water, mud, dust and dirt are all expelled from the disc rotor surface which is especially reassuring in adverse driving conditions. Post up if your keen!